Apple CEO Tim Cook's explained that he no longer labels to the Apple TV as a "hobby" box because of its growing hardware sales and the amount of content people are buying directly from the set-top box. He revealed that total Apple TV sales have reached 20 million units only when confronted by a question about the Amazon Fire TV and its newly announced HBO Go content deal. "If I look broadly at the content on Apple TV, I think it compares extremely favorably to the content that is on the Amazon box," Cook said during today's quarterly conference call. 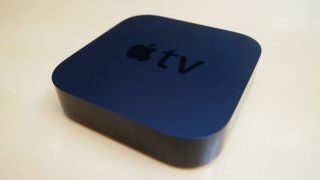 "We've sold now 20 million of the Apple TV. We've got a pretty large install base there and I feel quite good about that business and where it can go." The "where it can go next" reference may hint at the long-rumored Apple iTV, though the set-top box is reportedly due for a Siri-incorporated fresh before the year is out. In addition to touting the 20 million figure in the face of a question about the Amazon Fire TV, Cook said that the video streaming rival "got a deal for older content" from HBO. Indeed Amazon Prime subscribers only get access to select HBO shows and earlier seasons of still-running series. An HBO Go app is also coming to Fire TV at later date while it's on Apple TV right now. An even more impressive number came from Apple's iTunes account growth. It now sits at 800 million, most of which have credit cards attached to the account, according to Cook. The Apple CEO said he was already pleased with content sales through the set-top box, so he should be even happier when more of these existing iTunes account holders finally spring for an Apple TV.